I was chronically exhausted and needed to sleep for 11 to 12 hours to feel human. Things didn’t get much better, despite starting thyroid medications in 2010, and even going gluten free/dairy free in 2011 (though the former reduced my cold intolerance, need for sleep by about one hour, and anxiety, while the latter helped to eliminate my acid reflux, irritable bowel syndrome, joint pain and reduced my thyroid antibodies). I didn’t think the fatigue would ever leave. Quite honestly, I accepted it as part of who I was. But then, I started taking betaine with pepsin on Friday, February 10, 2012, one capsule with each meal containing protein. I was surprised to wake up the following morning at 8 am without an alarm. I had been dragging myself out of bed after 10 most mornings when I did not have to work. Strangely, I continued to feel energetic all day. I even stayed awake when my usually much more energetic husband took a nap. Things became easier, and all of a sudden, I felt that I had a surplus of time. I felt more at ease going to bed and even had time to meditate, something that I had wanted to do for years! As the week went on, I felt myself having more and more energy and became more outgoing and talkative. Additionally, the mental fog was completely lifted, and I could come up with all sorts of clever words quickly! My co-workers commented on my good mood at work. My husband noticed that my sense of humor and memory even improved. I felt like my old, pre-Hashimoto’s self again, the self that I had not seen for almost ten years. I continued to increase the dose of betaine with pepsin, until one day, I woke up at 5:17 a.m. and decided to start writing the book: Hashimoto’s: The Root Cause. I had always loved writing and dreamed of writing a book that would help others. I even took a writing workshop in 2007—the instructor suggested that working people have the best chance of writing a book by waking up two hours prior to their usual rising time and writing. With a full-time job and my sleep demands, I thought becoming an author would be impossible, and I gave up that dream. But now, here I was… doing the impossible, waking up a few hours before work and writing! Certainly, I thought, if I could wake up energized with six hours of sleep after feeling chronically exhausted for ten years, I could easily overcome Hashimoto’s and then write a book about it to help everyone else figure it out! This was a huge breakthrough. I figured out that I had been suffering from low stomach acid! Have you been experiencing symptoms related to low stomach acid as well? Contracting parasites from our food – Stomach acid helps us sterilize our food, killing off potential infecting pathogens. Food sensitivities – Proteins that are not properly broken down are more likely to induce an antigenic response from our immune system leading to food sensitivities, especially to gluten and dairy. Small intestinal bacterial overgrowth (SIBO) – Without stomach acid which keeps them at bay, bacteria in the small intestine may grow and thrive on poorly digested proteins. In one small study, 54 percent of people with hypothyroidism were found to have SIBO. Nutrient Depletions – especially in iron, calcium, ferritin, and B12. If prolonged, low stomach acid can lead to hypergastrinemia, (excess secretion of gastrin, another digestive enzyme, as a compensatory mechanism due to low stomach acid), which can lead to tumors/cancerous growth in the gastrointestinal tract. There aren’t too many tell-tale signs of low stomach acid, other than perhaps feeling full and tired after meals as well as experiencing acid reflux like symptoms. Nonetheless, low stomach acid is very common in Hashimoto’s. Signs and symptoms that would lead me to believe that a person with Hashimoto’s had low stomach acid include: acid reflux (this condition that is conventionally treated with acid suppressants can actually be caused by low stomach acid), low B12, ferritin, or iron levels, fatigue despite thyroid medications, and constipation/diarrhea. Betaine HCl and pepsin are naturally occurring components of gastric juice that make nutrients and amino acids from our protein containing foods more bioavailable by breaking down protein bonds. They are especially important for proper absorption of protein, calcium, B12, and iron. Betaine, also known as trimethylglycine, is a naturally occurring amino acid derivative that is isolated from beets, and the acidic HCl version of it promotes gastric lumen acidity. Betaine HCl used to be available as an over-the-counter (OTC) drug, marketed as a stomach acidifier and digestive aid, but it was removed from OTC use in 1993 due to insufficient evidence of it working, and was banished to being a dietary supplement by the FDA. (Dietary supplement companies cannot make claims of the effectiveness of their products, while drug companies can make specific claims). However, studies done in 2014 did indeed find that betaine HCl can re-acidify gastric pH. In other forms, trimethylglycine is also used to reduce fat tissue and increase lean muscle mass in pigs (though there are no studies to support it can do the same for humans), and can be helpful for breaking down homocysteine, especially in those with the MTHFR gene mutation. It can also be a helpful adjunct in depression, by increasing endogenous amount of SAMe, a naturally occurring substance with mood boosting and pain relieving properties. It is available as a supplement in the US, and as a drug in other countries. In my May 2015 survey of 2232 people with Hashimoto’s, out of 627 people who took betaine HCl and pepsin, 59 percent of people said that it made them feel better, 33 percent said that it made them feel worse, while 7 percent saw no difference in symptoms. Based on the improvement rates, this leads me to believe that 50-70 percent of people with Hashimoto’s are likely deficient in stomach acid. Those that felt worse were likely not deficient, as taking the supplement can make a person with adequate stomach amounts feel worse for a short time (burning in the throat and stomach upset may occur). Those that did not see improvement may not have been dosed adequately, as betaine with pepsin dosage needs to be individualized. The biggest improvements seen after taking this supplement were improved energy levels (58 percent of those who found it helpful reported this), reduced pain (40 percent reported this, to my surprise), and improved mood (35 percent). One fourth of people felt that this supplement also helped them with losing weight. The body does not need to expend as much energy on digestion, and since digestion is one of our body’s biggest energy expenditures, we often have a surplus of energy. The amino acids found in proteins become bioavailable, helping with creating neurotransmitters and fuel for our bodies. We are less likely to react to our foods, as the food particles get broken down into individual amino acids before they get further down into our gut. We feel lighter after we eat, and do not have cravings for food when full. But some people should NOT take betaine with pepsin. Signs and symptoms of an ulcer: dull pain in stomach, weight loss, nausea/vomiting/acid reflux, bloating/burping. Pain improves when you eat, drink or take antacids. Signs and symptoms of gastritis: gnawing/burning in your upper abdomen, nausea/vomiting, fullness after eating. Symptoms can improve or get worse after eating. A person using proton pump inhibitor medications would not likely want to take betaine with pepsin, as these medications and the betaine with pepsin have opposing effects. Additionally, while having hypothyroidism or Hashimoto’s in itself can cause low stomach acid, as can aging and genetics, there are other root causes of low stomach acid that need to be considered. H. pylori infections, which can also trigger Hashimoto’s. B12 deficiency, which may be associated with a vegan diet or with anti-parietal cell antibodies. Adrenal dysfunction, which can deplete nutrients required for stomach acid. The MTHFR mutation, which is associated with a buildup of homocysteine due to impaired methylation. There are two main pathways of breaking down homocysteine. One of them involves the use of Trimethylglycine (betaine), and this gene mutation could theoretically make someone trimethylglycine deficient. Other nutrient deficiencies, especially in thiamine. Betaine HCl and pepsin should be taken with a protein-rich meal, starting with one capsule per meal. The dose should be increased by one more capsule at each meal until symptoms of too much acid are felt (burping, burning, warming in the stomach region, etc). At that point, you will know that your dose is one capsule less than what resulted in symptoms. 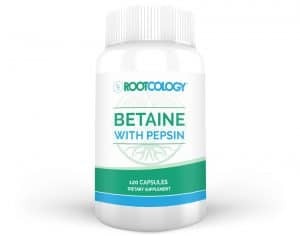 I recommend Rootcology Betaine with Pepsin, which provides 750 mg of betaine hydrochloride along with 50 mg of pepsin, and is free of fillers and common reactive ingredients like gluten, dairy, soy and pesticides. I also like the Pure Encapsulations brand, which contains Vitamin C derived from non-GMO corn dextrose, in addition to betaine and pepsin. The dextrose, a corn sugar, is consumed in the creation of the Vitamin C and does not contain corn proteins, which are the reactive component of corn for most people with Hashimoto’s who are corn sensitive. The supplement itself is hypoallergenic. I hope this information helps you on your journey! Have you been having trouble with symptoms of acid reflux? Have you tried betaine with pepsin and seen improvement? 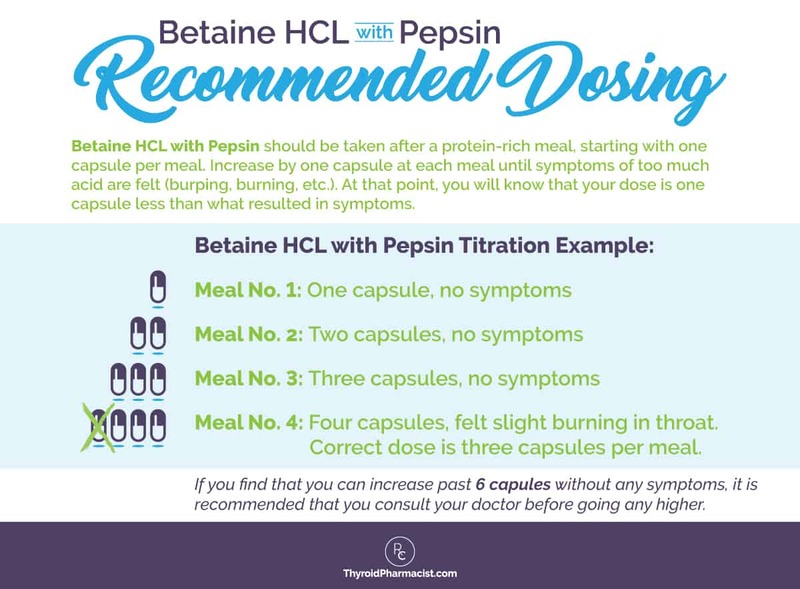 To learn more about betaine with pepsin in addition to other helpful interventions, please consider picking up a copy of Hashimoto’s Protocol: A 90-Day Plan for Reversing Thyroid Symptoms and Getting Your Life Back and Hashimoto’s Thyroiditis: Lifestyle Interventions for Finding and Treating the Root Cause. Betaine HCl with Pepsin. Supplement Information. Pure Encapsulations. https://www.purerxo.com/thyroidpharmacist/rxo/products/product_details.asp?ProductsID=929. Accessed October 9, 2015. Kohli DR, Lee JZ-E, Koch TR, Talavera F, Anand BS, Greenwald D, et al. Achlorhydria Clinical Presentation. Medscape. http://emedicine.medscape.com/article/170066-clinical#b5. Updated July 15, 2016. Accessed May 3, 2018. Osborne D, Sobczynska-Malefora A. Autoimmune mechanisms in pernicious anemia & thyroid disease. Autoimmun Rev. 2015;14(9):763-768. Rojas Hernandez CM, Oo TH. Advances in mechanisms, diagnosis, and treatment of pernicious anemia. Discov Med. 2015;19(104):159-168. Gerenova, Manolova M, Tzoneva VI. Clinical significance of autoantibodies to parietal cells in patients with autoimmune thyroid diseases. Folia medica (Plovdiv). 2013 Apr-Jun;55(2):26-32. Lauritano AC, Bilotta AL, Gabrielli M, Scarpellini E, Lupascu A, Laginestra A, et al. Association between hypothyroidism and small intestinal bacterial overgrowth. J Clin Endocrinol Metab. 2007;92(11):4180-4184. Betesh AL, Santa Ana CA, Cole JA, Fordtran JS. Is achlorhydria a cause of iron deficiency anemia? Am J Clin Nutr. 2015;102(1):9-19. Jensen RT. Consequences of long-term proton pump blockade: insights from studies of patients with gastrinomas. Basic Clin Pharmacol Toxicol. 2006;98(1):4-19. Aghili R, Jafarzadeh F, Bhorbani R, Khamseh ME, Salami MA, Malek M. The association of Helicobacter pylori infection with Hashimoto’s thyroiditis. Acta Med Iran. 2013;51(5):293-296. Note: Originally published in October 2015, this article has been revised and updated for accuracy and thoroughness. Thank you for this great information. Is it okay to do a trial of betaine with pepsin if someone has leaky gut? Also, would the supplements have a high oxalate content like beets (I have kidney stone issues)? Dee- Not everyone will need every single supplement! In fact, I believe that most nutrients should come from the diet, this is why I always list food sources for most of the nutrients, vitamins, minerals and probiotics that are depleted in Hashimoto’s in the book and on the blog. However, some may require/prefer supplements and the supplements on the website are a resource for those that do. I recommend getting tested for deficiencies to determine your need for a supplement as instructed in the book and blog. I also don’t recommend starting multiple supplements all at once. I recommend starting one at a time and then adding another a week or so later once it has been confirmed that the first supplement is not causing any harm. I need to know more about supplements. In both books can I read about supplementation? Based on the recommendations in your book, I started Pure Encapsulated Digestive Enzymes Ultra with Betaine Hydrochloride resulting in great improvement as you experienced. Unfortunately, I was diagnosed with Interstitial Cystitis last week and instructed to remove acids. Are there acid alternatives that would not be contraindicated with IC? Amit- Thank you so much for following this page! Do you have Hashimoto’s or a thyroid condition? What do you recommend for betaine hcl with pepsin for someone who can’t swallow pills. I spoke with My endocrinologist and he has no problem with me trying this. Where can I purchase? I’m curious about the vinegar. Since it’s an alkaline wouldn’t if further inhibit stomach acid? I have also started taking betaine with pepsin along with glutamine, zinc and probiotics to help with digestion, leaky gut and rebuilding my gut flora. I also take selenium. When can I expect or how will I know when I can stop taking these, mostly the betaine with pepsin? I just don’t know the duration that I should be taking these supplements. Thanks! Dr. Wentz~ First I thank you for all your hard work to help find the root causes of Hashimotos. So, I have suspected low stomach acid for some time now, and I attempted the Betain HCL w/ Pepsin challenge. I was up to 9 pills with no discomfort, and I was nervous that I would injure myself if I took more. Thoughts on this? Thanks again. Izabella, you did not comment on the number of capsules taken by Lesley (“I was up to 9 pills with no discomfort, and I was nervous that I would injure myself if I took more. Thoughts on this? Thanks again.”). How much is too much? I am now up to 5 capsules with no discomfort. Cynthia – thank you for following this page. Please email my team at info@thyroidpharmacist.com with any specific questions regarding my supplement line and they will be happy to help you. Hi, this article says to not take betaine with pepsin hcl if you have gastritis. What if we have gastritis from low stomach acid and also had our gallbladder removed, what would you recommend? Corinne, Have you found any other helpful information about this, or from a practitioner? I am in the same boat. Yes, you are SO RIGHT about the hypochlorhydria being a root cause of Hashimoto’s. And what’s the root cause of the hypochlorhydria? B6 deficiency. And what’s the root cause of the B6 deficiency? A common but utterly under diagnosed metabolic condition called Pyroluria. PYROLURIA – look into it. Alethea- Thank you so much for sharing!! I highly recommend that you work with a functional medicine clinician. It’s a whole medical specialty dedicated to finding and treating underlying causes and prevention of serious chronic disease rather than disease symptoms. Melissa – I highly recommend that you work with a functional medicine clinician. It’s an entire medical specialty dedicated to finding and treating underlying causes and prevention of serious chronic disease rather than disease symptoms. Thank you so so much! Thank you for taking the time to read my comment and respond to me. 🙂 ! Thank you so much for taking the time to write this article! I have wondered if I have low stomach acid and many if the symptoms listed are ones I deal with. I was diagnosed with Hashi’s 5 years ago and it’s been a journey learning how to help my body! Is the Betaine with pepsin something that once started always needs to be taken or does your stomach start to eventually make more acid on its own? And when taking the Betaine can other vitamins be taken at the same time or will it affect absorption ? Thank you so much again! I have read most of your book. It is not clear to me what was the root cause of your Hashimoto’s. Was it the low stomach acid the root cause of your Hashimoto’s? Cyrus – Thank you so much for asking about me. We are each so unique. I really encourage each person to follow their own customized path to health. Here are a couple of articles that you may find helpful. Why acid reflux came back with taking ACV with lemon in the mornings? I was able to regulate my digestion with the diet for Hashimoto’s and now I have very bad acid reflux. Betaine appears to help me. I hope it gets better with time. Should I avoid acidic foods? Dr Wentz, I am slightly confused about exactly when the best time is to take the betaine with pepsin tablets. In your post you mention to take it at the end of the meal but most other articles indicate to take it before the meal and one even says it should be taken in the middle of the meal. Can you please clarify why it is better to take it at the end of the meal and must it be the moment you finish the meal or can it be 5 or 10 minutes after the meal? Tesla – thank you for following this page. You should start with the directions on the bottle and adjust your dosage from there. I cannot tell you specifically what you can and cannot do over the internet as I could be held liable for what would happen to you. I have tried EVERY way, and for me, taking a little of my meal before I take my enzymes then finishing helps minimize any acid/ burning feeling. Also, I only take the betaine HCl w pepsin with a protein meal. If it’s only vegetables and light carbs, I take lighter enzymes. Yvonne – thank you for following this page. Here is an article you might find helpful. Hello Dr. Wentz, I’ve been supplementing with Betaine plus Pepsin for over a year now. During this time I found out I have a pork allergy and just made the connection after reading your article that the pepsin is derived from porcine. Do you know if there’s a supplement with only hydrochloride acid? Samantha – thank you for following this page. Please contact my team at info@thyroidpharmacist.com and they will be happy to help you. I was diagnosed with Mitochondrial Disorder 10 years ago by a Molecular Neurologist. I had follow-on evaluations at Mayo in Scottsdale and also participated in a research treatment study at the Barnes-Jewish clinic on the campus of St. Louis U. The outcomes were the same–confirmation of mito disorder, but no definitive treatment options, merely “strong” recommendations for taking Carnitor, COQ-10 and Alpha Lipoic Acid for life, which I’ve been doing daily since that time. Unfortunately, my health has continued to plummet, especially over the past year. My fatigue/dizziness are perpetual upon waking and never subside during the day, but worsen throughout the day. In addition to the aforementioned diagnosis, I they also confirmed that I have Fibromyalgia, MTHFR Deficiency, Peripheral Neuropathy, Ankylosing Spondylitis, Amyloidosis, Cervical Stenosis, Cervicogenic Dizziness, Autoimmune Neuropathy, Autonomic Fiber Sensory Neuropathy, Degenerative Joint Disease & Osteoarthritis, Adrenal Fatigue, Autoimmune Autonomic Ganglionopathy, and finally, military-related PTSD. Otherwise, I feel just terrific! With this expansive list of rare and problematic diseases and disorders, it’s been a challenge finding and keeping doctors that are specifically trained/knowledgable about treating these medical issues. Some have told me they simply don’t believe that I have all of these maladies, and others have said they don’t have the time required to research/treat these relatively uncommon issues, but encourage me to continue searching for a doctor that may be well informed and motivated for offering treatment. At the moment I’m basically in limbo because the neurologist I saw three times abruptly left her practice for family-related issues, so I’m back to square one trying to find a doc with this specialty. This is frustrating, disappointing and depressing. If you have any recommendations or suggestions I would appreciate hearing them. Thanks for your interest, have a pleasant day. Jim – thank you for following this page. My heart goes out to you. <3 I highly recommend that you work with a functional medicine clinician. It’s an entire medical specialty dedicated to finding and treating underlying causes and prevention of serious chronic disease rather than disease symptoms. be another reason or should i test again? I havea pH of 7. Friederike – thank you for following this page. Here are some articles you may find interesting. I was diagnosed with Hashimoto’s 7 years ago, after a bout with Alopecia U. Reading up on the symptoms and signs, I suspect I’ve had a low thyroid my whole life. One thing struck me in this article, however. The connection between H. Pylori and Hashimoto’s. In my early 20’s, I had been diagnosed with a peptic ulcer. H. Pylori had not been discovered yet, but I often wonder if that is what started my ulcer. Now, I can’t help but wonder if that is what triggered the Hashimoto’s. I have not had ulcer symptoms in over 20 years. Would it be safe for me to try Betaine HCl with Pepsin? I have all of the symptoms that you list in this article. Jean – thank you for following this page. Here are some articles you may find interesting. Is this okay to take while breastfeeding? Trina – thank you for following this page. Please contact my team at info@thyroidpharmacist.com and they will be happy to help you. I have been taking betaine HCL for a couple of years now and can’t seem to get my stomach acid to produce naturally. I am not sure why I still have low stomach acid. My thyroid levels are optimal and I don’t have any nutritional deficiencies that I know of. After taking a round of thiamine supplments I needed to increase my dosage of HCL. Any ideas how to get my body to produce higher levels of stomach acid on its own? Erica – thank you for following this page. We know that intestinal permeability (aka leaky gut) is present in every case of autoimmunity and often precedes the development of Hashimoto’s. Symptoms of leaky gut may include bloating, diarrhea, constipation, stomach aches, acid reflux and irritable bowel syndrome. According to the Institute of Functional Medicine, many people develop IBS 5-10 years before an autoimmune diagnosis. I was one of them and didn’t take my gut health as seriously as I should have. Gut problems are often caused by infections like H. pylori, parasites like Blasto, SIBO, an imbalance of bacteria, and enzyme deficiencies or food sensitivities (especially to gluten, dairy, and/or soy). Even stress can be a factor in gut permeability. Here is an article you might find interesting. I supplemented Betaine HCl for 30 years and could never figure out why my stomach acid was so low. It did help me a lot. However, I began taking an iodine supplement at 12.5 mg daily 2 years ago and within 2 weeks, I had normal stomach acid. This has continued and is a blessing. My thyroid bloodwork has always been normal and has continued normal (TSH 1.1) – most recent testing was last month. I think there is more to the iodine controversy that needs to be addressed by you and other health care practitioners Dr Wentz. Is there a way to test if a person has low stomach acid? Carol – thank you for following this page. We know that intestinal permeability (aka leaky gut) is present in every case of autoimmunity and often precedes the development of Hashimoto’s. Symptoms of leaky gut may include bloating, diarrhea, constipation, stomach aches, acid reflux and irritable bowel syndrome. According to the Institute of Functional Medicine, many people develop IBS 5-10 years before an autoimmune diagnosis. I was one of them and didn’t take my gut health as seriously as I should have. Gut problems are often caused by infections like H. pylori, parasites like Blasto, SIBO, an imbalance of bacteria, and enzyme deficiencies or food sensitivities (especially to gluten, dairy, and/or soy). Even stress can be a factor in gut permeability. Here is an article you might find interesting. Thank you for your amazing content and book. I just noticed that I have been taking Betaine HCI & Pepsin instead of the one with “J” that you have listed above. can you explain the difference? Do you suggest the other one to be used instead? Arda – thank you very much for your support! 🙂 Please contact my team at info@thyroidpharmacist.com and they will be happy to help you. once you find your dosage of betaine do you still take after the meal or before? Kelly – thank you for following this page. Not everyone will need every single supplement! In fact, I believe that most nutrients should come from the diet. This is why I always list food sources in the book and on the blog, for most of the nutrients, vitamins, minerals and probiotics that are depleted in Hashimoto’s. However, some may require/prefer supplements and the supplements on the website are a resource for those that do. I recommend getting tested for deficiencies to determine your need for a supplement as instructed in the book and blog. I also don’t recommend starting multiple supplements all at once. I recommend starting one at a time, and then adding another a week or so later once it has been confirmed that the first supplement is not causing any harm. Sure would love to give this a try but the price, conversion, and shipping makes it cost prohibitive for us outside of the US….is there anywhere else that you can find something similar to at least trial it? I hope that the above helps! Hello Dr. Wentz, this is SO exciting for me because I’ve been looking for my root cause after being diagnosed July 2016……I believe I have low stomach acid which I never thought possible because I don’t have the bloating or burping/gas that many others have, my biggest symptoms are severe fatigue and very irregular bm’s. I started drinking celery juice last week every morning and symptoms seems to be getting better…..something really clicked when I read that when your stomach can’t break down the food particles they can make you sick over time……..thank you SO much for your understanding of this disease and sharing your journey and the things that one can try to help with their own illness. I would like to try the Betaine with pepsin but at this time I do better with supplements in liquid form so will be looking into that as pills just seem to sit there and build up in my system making me sick, which makes total sense if they are not being broken down and utilized!! Jeannie – thank you for following this page and for sharing what has worked for you! I am looking forward to seeing you progress on this page. You might also be interested in my books. Can taking this lead to c. diff if your a past c. diff sufferer? Kim – Thank you for following this page. Please, understand that due to liability issues, I am unable to answer specific medical questions, but I highly recommend that you work with a functional medicine clinician. It’s an entire medical specialty dedicated to finding and treating underlying causes and prevention of serious chronic disease rather than disease symptoms. You mention in your book that you shouldn’t take Betaine and pepsin if you have an H. Pylori infection. Can you tell us why? Thank you. Kristy – thank you for following this page. If you have Hashimoto’s and a history of ulcers, PPI use, NSAID use, or steroid use, I highly recommend testing for gut infections, especially H. pylori and SIBO, which could be triggers of gut symptoms and Hashimoto’s. As HCI may irritate stomach ulcers, best to test first! <3 Hope that helps. Tim – Thank you for being here. It’s impossible for me to respond to tens of thousands of people without using pre-made responses. Many of the questions are the same. I appreciate your understanding. I’ve seen wonderful results in how I feel taking the Betaine with Pepsin. I’ve had so much energy, and I feel so much better after my meals. It’s been a real mood booster, feeling like something’s actually working. I had a question, though. You say you need to take this after consuming protein-rich meals, but would you also recommend taking it after the AI Paleo Protein Powder? I’ve been taking this lately along with the Betaine wit Pepsin and I started wondering if it was necessary since my body wasn’t necessarily working as hard to digest it. What would you say? Brandon – thank you for following this page. For questions pertaining to the supplements please contact my team at info@thyroidpharmacist.com and they will be happy to help you. I have Hash for 10 years and 2 years ago was diagnosed with an esophageal stricture. My Dr stretched it during an Endoscopy. He said I had inflammation below the stricture so gave me Omeperazole. I took it for a year or so then quit. I felt it was screwing up my Levothyroxine absorption. I have already tried taking Young Living Essential of Lemon. I felt great and had tons of energy. But was scared I was again altering my Levo absorption. I have reflux symptoms after 6 months of having the scripture stretched. Don’t know what to do. My endocrinologist says all my numbers are good. Will lemon essential oil work for me without changing my lab numbers? Donna – thank you for following this page. I highly recommend that you work with a functional medicine clinician. It’s an entire medical specialty dedicated to finding and treating underlying causes and prevention of serious chronic disease rather than disease symptoms. Dr. Izabella Wentz I am 65 yrs old, female. Several years ago, on a doctors recommendation, my thyroid was treated with Radioactive Iodine. Recently I had to go to the ER with severe pain in my sternum and had a EGD a week later. My doctor told me that I am not producing enough stomach acid. I am on Armour Thyroid and I cannot take Levothyroxine. I am wondering about trying this Betaine HCl with Pepsin. I want to try something natural rather than having a doctor Rxing me. What do you think? Thank you. I’m actually on 6 pills so far and no “burning” or “stomach discomfort” at all. Right now I’m doing the Gut Protocol in your book Hashimoto’s Protocol. I’m up to 19 of the Betaine with Pepsin and I haven’t gotten the burning sensation in my throat. Should I keep going up in dose? Can somebody with insomnia take this betaine wth pepsin with aggravating sleep disorder? Hi Dr Izabella I recently had Hiatal Hernia Surgery 1 1/2 months ago! I am on PPI med and I still seem to have difficulty breathing and possible acid reflux! I have hashimotos and celiac! Also I have been diagnosed with IBS! I believe I may have LPR and thats why I may have breathing problems and Voice Loss! I think this PPI could be making my acid worse! However, I was diagnosed with small peptic ulcers in my stomache several years ago, about 15 approximately! I want to see if pepsin will help me and I want to get off this PPI Med! Im concerned about the long term side effects of PPI! Also I need to get my voice back and brething under control! Please advise! What doctor can I go to that will detrrmine if I need pepsin or not? Or should I just order a test myself to see if I need pepsin? And do you think its ok for me to take pepsin since I had GERD, IBS, HIATAL HERNIA, possible LPR and PEPTIC ULCERS! Also, I had 3 ulcers in my esophegus that has healed I think! So please help me to decide a coarse of action as these current symptoms disrupt my life greatly!!! I need a plan! Thanks You for this post! Mark – thank you for sharing your journey. I am so sorry you are struggling. I know how overwhelming everything can be. Gut healing is a journey; you may need various interventions like removing reactive foods and infections, taking enzymes and probiotics, and balancing nutrients. In some cases, such as after a bout of food poisoning, antibiotic treatment, or a stressful life period, you may need to start from scratch once more. Remember, be kind to yourself and learn to listen to your body so that you can support and feed it properly! You are worth it! You may find this article helpful as well! I also highly recommend that you work with a functional medicine clinician to be a part of your own health care team. It’s an entire medical specialty dedicated to finding and treating underlying root causes and prevent serious chronic disease rather than treating individual disease symptoms. I’ve had stomach problems most of my life (first ulcer was at age 12). I currently take hcl w/pepsin, and I am SO thankful for it! My question is, is it normal to still have problems belching up food? Like solid or semi solid chunks. Is that a thing g happening to others, or am I the oddball out? What, if anything, is there to do about it? Joni – thank you for reaching out. I highly recommend that you work with a functional medicine clinician to be a part of your own health care team. It’s an entire medical specialty dedicated to finding and treating underlying root causes and prevent serious chronic disease rather than treating individual disease symptoms. How would you address someone who refluxes all supplements (including collagen!)? LOVED your last book. Purchased nearly all the liver supplements recommended. Sadly I refluxed all of them. This seems to be a trend for me with supplements lately. Feel very defeated as I try to move forward with my health. Thinking about starting with your H pylori procotol. Or, how would you advise someone to get through this obstacle? Thank you for all you do! Sherri – thank you for reaching out and sharing your journey! I am so sorry to hear you are struggling with supplements. <3 I highly recommend that you work with a functional medicine clinician to be a part of your own health care team. It’s an entire medical specialty dedicated to finding and treating underlying root causes and prevent serious chronic disease rather than treating individual disease symptoms. I believe that everyone needs to find a practitioner that will let him/her be a part of the healthcare team. You want someone that can guide you, that will also listen to you and your concerns. You want someone that’s open to thinking outside of the box and who understands that you may not fit in with the standard of care. It's a good idea to ask some standard questions when contacting a new doctor for the first time. Something else to consider is you can work with a functional doctor remotely, via Skype. You could also contact your local pharmacist or compounding pharmacy, who may be able to point you to a local doctor who has a natural functional approach. I encourage you to keep looking for the right one for you! Here are some resources you might find helpful. Deeply appreciate your thoughtful and honest response. Overwhelmed trying to decide who will be the best match. Wish you were still seeing clients. 🙂 Thank you again for taking the time to share your thoughts. I learned about this supplement reading your book but don’t recall the dosage info. I began taking because no matter what I ate I felt tired after meals. I eat relatively clean (free from gluten, dairy, processed foods) but still felt tired. It does seem to help but now I need to test the dosage because I’ve only taken 1 capsule at meals. Angelo – thank you for reaching out. There aren’t too many tell-tale signs of low stomach acid, other than perhaps feeling full and tired after meals as well as experiencing acid reflux like symptoms. 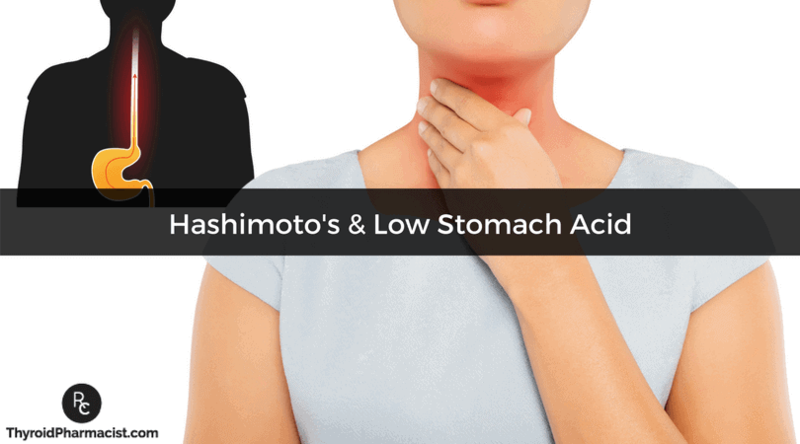 Nonetheless, low stomach acid is very common in Hashimoto’s. Signs and symptoms that would leave me to believe that a person with Hashimoto’s had low stomach acid include: acid reflux symptom (this condition that is conventionally treated with acid suppressants can actually be caused by low stomach acid), low B12, ferritin, or iron levels, fatigue despite thyroid medications and constipation/diarrhea. Here is an article that might be helpful as well. Hi, I was just wondering about the contraindication between betaine and NSAIDs. I do take NSAIDS every once in a while. Is this okay, or are you more referring to people who take them regularly (like daily)? Dr Isabella, thank you for all you do for Hashimotos people like me. I discovered your Root Cause Book in 2016 & immediately began AIP protocol. Helped immensely! My husband was in critical plane crash in that year & the stress load obviously did a number on me, in particular my gut! Last year has been AWFUL, bloating, serious constipation, many food sensitivities, weight loss. I tested three months ago for SIBO, it was positive, began treatment with Atrantil. Helped for one glorious month, then symptoms returned big time. So discouraging! I was out of town & the thought went through my mind about what you wrote re:low stomach acid & digestive enzymes. I pulled to nearest store & bought Betaine w/Pepsin & G.O.L. digestive enzymes…WOW!!! Just what my belly needed! All the symptoms are gone, I have been reintroducing foods from AIP (I had also been on FODMAPS), my digestion is steadily improving, my energy & mood better!! I take one digestive enzymes before my meal, then wait 20 min after my meal & take my Betaine. I followed your protocol on dosage. Dr Went, I truly thank you, your book & life story have helped me immensely. I’m very grateful!! These stories will go a long way in helping others who are going through a similar journey to yours. Thank you for your consideration! Dr Isabella, thank you so much, I would be humbled & honored to share my testimonial in hopes of helping others who struggle like I have. Where I live it’s near impossible to find a functional medicine Dr, so I’ve had to play my own doctor. I’ve done tons of research, your book being such a godsend! So..I will gladly share the stuggles & triumph on this journey of battling the many faces of Hashimotos! Thank you & God bless you Isabella! Hi Dr Wentz, I had sibo and got rid of it but now it is back. The last time I had sibo I supplimented with HCL with pepsin but I would gett terrible belching and burping even with one tablet. I stopped taking it bc I assumed this meant I had enough stomach acid. I have a very leaky gut celiac and lots of food intolerances and terrible ibs-c. I am under the care of a functional med dr and I read your Hashimotos book as I am “pre” hashimotos Great book! I do no tolerate any meat. Igg allergy response. My question is….if I do the vaking soda test and it shows I have low stomach acid how could I take HCL with pepsin if I only eat cook low fodmap veggies? That probably wouldnt be enough protien would it? How can I suppliment with it on a limited diet? Im thinking maybe its part of the reason why my sibo came back. My dr thinks it came back bc of slow motility not stomach acid. Any advice would be extremly helpful! Thanks. Holli – thank you for reaching out and sharing your journey. It’s possible that you didn’t fully eradicate it or that it “grew back.” I recommend retesting two weeks after your treatment to ensure that it really is gone and not just reduced. In some cases, you may also want to explore prokinetic treatments to prevent SIBO. COULD SIBO BE PREVENTING YOU REMISSION FROM HASHIMOTO’S? Sherri – thank you for reaching out and sharing your journey. I am so sorry to hear you are still struggling with this. I understand how frustrating it can be. <3 We know that intestinal permeability (aka leaky gut) is present in every case of autoimmunity and often precedes the development of Hashimoto’s. Symptoms of leaky gut may include bloating, diarrhea, constipation, stomach aches, acid reflux and irritable bowel syndrome. According to the Institute of Functional Medicine, many people develop IBS 5-10 years before an autoimmune diagnosis. I was one of them and didn’t take my gut health as seriously as I should have. Gut problems are often caused by infections like H. pylori, parasites like Blasto, SIBO, an imbalance of bacteria, and enzyme deficiencies or food sensitivities (especially to gluten, dairy, and/or soy). Even stress can be a factor in gut permeability. Here are some articles you might find interesting.